How far would you go to appease the Gods? Yesterday, I posted five videos on seven wonders of ancient Hellas: the Theatre of Epidaurus, the statue of Zeus at Olympia, Apollon's Temple at Delphi, the Colossus of Rhodes, the settlement at Santorini, the Palace of Knossos, and Athena's sanctuary at Athens: the Parthenon. Today, I'll tell you a bit more about the wonders, the mythology behind them and the influence of these wonders. The palace of king Minos at Knossos (Κνωσός) is legendary because it was home to the minotaur who roamed the maze beneath it. In the myth, Theseus--a young, brave, hero--lets himself be amongst those who will be sacrificed to it, and with the help of Ariadne's string, is able to kill the minotaur and leave the maze again, unharmed. It's one of the myths that everyone knows. The palace in which the myth takes place, however, is less well known but equally impressive. It is an architectural marvel, which was incredibly ahead of its time. Even the ruins are impressive. Myth tells us that the entire palace complex was designed and built by Daidalos (Δαίδαλος), under contract of king Minos. The most famous part of the building was the maze, which lay below the entire structure. Yet, the entire palace was a trap for anyone who did not know his or her way around it. Daidalos was held prisoner in the palace after its completion, just so he would never be able to spill its secrets to anyone. This led to the myth of Daidalos and his son Íkaros (Ἴκαρος), escaping from the palace with wings made of feathers and wax. Íkaros never reaches the mainland: he either flies too high and melts the wax, or flies to low and gets the feathers wet. In both cases, he dies in the waves. Knossos was undeniably the capital of Minoan Crete. The ruins of the palace are located about twenty minutes south of the modern port town of Iraklio. Knossos was inhabited for several thousand years, from the neolithic to 1375 BC, when it was abandoned after its destruction. The first palace on the low hill beside the Krairatos river was built around 1900 BC on the ruins of previous settlements. It--and many of the other buildings--were destroyed around 1700 BC by an earthquake or invaders. It was rebuild and destroyed or damaged again and again by earthquakes, volcano eruption, invaders and fires, until its abandonment. With its demise came the demise of the Minoan civilization. I have already written quite a bit about the Oracle at Delphi, yet the temple is equally impressive as the oracle(s) that it housed. From being dedicated to Gaea, to a main site of worship for Apollon, the huge complex has a place in a great variety of myths. There are few which are not inspired or aided by the words of the oracle, after all. The complex was also the site of one of the Panhellenic Games. The Delphi complex held the temple of Apollon, the Amphictyonic Council (a council of representatives from six Greek tribes that controlled Delphi and also the sports events), various treasuries where the votive offerings to Apollon and/or the oracle were stored, the altar of the Chians (the main altar, located in front of the temple of Apollon, funded by the people of Chios, the stoa of the Athenians (A series of seven futed columns, used to house Athenian war trophies and collect the stories of freed slaves), Sibyl rock (the rock where the prophet Sibyl sat to deliver her prophecies), a theatre, the Tholos (the sanctuary of Athena Pronaia), a gymnasium, a stadium, the Hippodrome (where the running events took place), the Polygonal wall, the Castalian spring, and a large variety of athletic statues. It's was--and is--a huge theater, seating 15.000 people. The theater was designed by Polykleitos the Younger in the 4th century BC. In the time of the Hellens, the theater had thirty-four rows. Another twenty-two were added in the time of the Romans. While there were many theaters in ancient Hellas, the theatre of Epidaurus is famous for its perfect acoustics. Even today, you can hear a match being struck on the stage from any point in the theater. For a limestone construction that's 2400 years old, that's pretty impressive. As far as I'm aware, the theatre does not feature in myth. Yet, many plays of the ancient times would have been performed there. The theatre was further surrounded by huge structures. 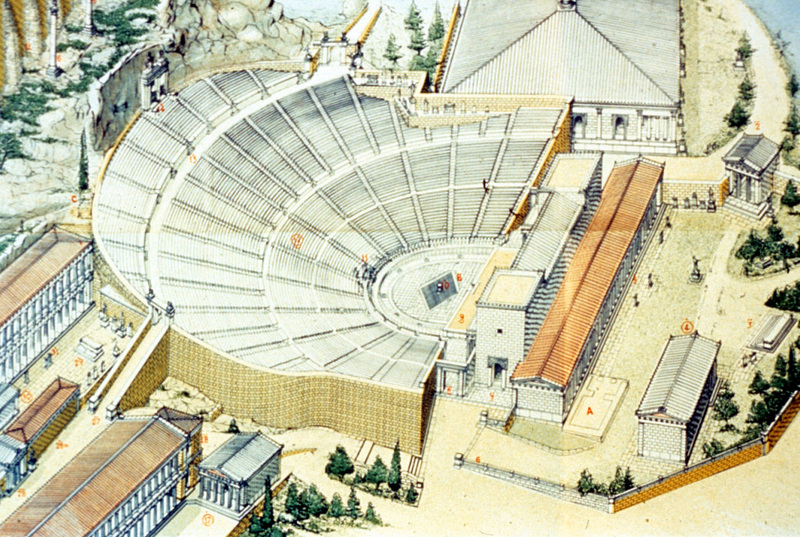 Besides the theatre, the polis of Epidaurus featured a ceremonial Hestiatoreion (a banqueting hall), baths and a palaestra (a wrestling school). Like the modern statue of Liberty, Rhodes had its own colossus, in the shape of the island's patron God--well, Titan--Helios. It is said to have stood a little over a hundred feet, or thirty meters, tall, on a fifty feet, or fifteen meters, pedestal. It was made out of bronze over an iron, or wooden, framework. Although there are accounts that place the statue over the harbor entrance, like pictured to the left, a construction like that would be incredibly hard to make even today. It's more likely the statue stood on one side of the harbor entrance or a little off onto a hill. Wherever it stood, it would have been an incredibly intimidating sight to behold for anyone meaning the island's inhabitants harm: a constant reminder that they were protected by a very powerful Titan. The statue was, in fact, paid for by enemy money. After Alexander the Great's death, a war broke out over his succession. sides were picked, other sides got angry and Rhodes found itself besieged. When the cavalry arrived, the attackers fled, leaving much of their equipment behind. The inhabitants of the island sold the equipment and invested the money in the statue. The sheer size of the statue gave it much of its glory, but also the fact that it was made with copper plating over a frame, made it a construction nightmare. Yet, the statue stood for nearly sixty year--until an earthquake literally shook the statue apart. Another very imposing statue is the statue of Zeus at Olympia. The seated statue, created by the Greek sculptor Phidias, was thirty-nine feet, or twelve meters, tall. Ancient accounts say that, if Zeus would have stood, he would have unroofed the temple. The statue was richly decorated with ivory and gold-plated bronze. The sculpture was wreathed with golden olive shoots and sat on a grand throne cedarwood, inlaid with ivory, gold, ebony, and precious stones. He held a small statue of crowned Nike, goddess of victory, in his right hand, and in his left hand, a sceptre inlaid with gold, on which an eagle perched. The statue was eventually destroyed, either in the fire that also destroyed the temple, or before, when it was carried off by Romans who either used the stone and precious metals to create something new, or to repurpose the statue as a representation of one of their own emperors. While it stood at Olympia, it was the literal seat of Zeus' power, and a focal point of His worship. The legend of Atlantis is actually of Hellenic design and is based in mythology. In Greek, the term 'Atlantis' means 'island of Atlas' (Ἀτλαντὶς νῆσος), and it may very well have applied to Santorini. It was Plato who brought new life--and myth--to Atlantis. According to him, Poseidon fell in love with Cleito, the daughter of Evenor and Leucippe, who bore him five pairs of male twins. The eldest of these, Atlas, was made rightful king of the entire island and the ocean--called the Atlantic Ocean in his honor--and was given the mountain of his birth and the surrounding area to rule over. It was also Plato who wrote that Poseidon made Atlantis--a huge island with a volcano at its center--His home after Zeus, Hades and He divided the world. Plato's description of Atlantis would have fit the ancient hellenic version of Santorini well. It was a large, mountainous, island, with an active volcano at its center. The large settlement on the island was build around said volcano. Poseidon's influence on the island isn't a stretch of the imagination at all; there was sea and ocean all around and from time to time, the entire island would tremble due to the volcano. The volcano eruption decimated the settlement, but from what archeologists and scholars have been able to piece together, the settlement was a sight to behold while it stood. It had walls eight meters tall, three story houses, beautiful frescos and a rich economic climate. The volcano eruption preserved much of the ancient city of Akrotiri, despite the huge lagoon the eruption left at the center of the island. It is perhaps the most famous of ancient Hellenic monuments: the Parthenon (Παρθενών) atop the Acropolis in Athens. It was the focal point of Athena's worship and is a major tourist attraction to this day. Because of its cultural significance--back then as well as now--it's part of the official seven wonders of the ancient world. The building that has survived to this day was not the first temple to Athena to grace the mountain. There was an older temple, but it was leveled by the Persians in 480 BC. After that, steps were undertaken to bring about an even more impressive temple for the patron Goddess of Athens. Despite a huge statue and a small altar, the Parthenon never housed the cult of Athena's worship. It was a status symbol for the city, and a show of devotion. Any religious rites concerning Athena--like the Panathenaia--were executed in or around another, smaller, building on the northern side of the Acropolis. Like so many Hellenic monuments, fire, war, and conquest wreaked havoc on the temple. The treasures that were housed within it were robbed, mostly by the Romans, and the temple fell into disrepair. The stone that remains now is mostly the outer shell of the building, but as someone who has seen it with her own eyes, I can tell you it's breathtaking. I would have loved to see it in all its grander. It may not have been a major religious hub, but it was--and is--one of the best know structures dedicated to a Deity. For that alone, it is rightfully called a wonder. Image sources: palace of Knossos, Apollon's temple at Delphi, Theatre of Epidaurus, Colossus of Rhodes, Statue of Zeus at Olympia, the settlement at Santorini, the Parthenon.